Powers/Abilities: Slaughter possessed vast regenerative abilities without any known limits, superhuman strength, vampiric features including vampire fangs and talons and the ability to turn himself into mist. He needed to consume human blood and meat to support his regenerative ability. He also got stronger the more he ate. Even without his superhuman powers he was a dangerous individual able to kill with or without a weapon due to his training with the US Marines and CIA. Slaughter especially liked to use two Uzis or pistols at once. Slaughter was never seen active during day since his transformation which would suggest that he had the same weakness against sunlight like Morbius or any real vampire. (Morbius#7 (fb) ) - Slaughter was a former US Marine, who had been transferred to special assignment. (Morbius#21 (fb) - BTS) - Slaughter knew Randolph Simpson from his time with the CIA. Slaughter never liked him because he had to compete with Simpson as an assassin. (Morbius#23 (fb) - BTS) - At some point during his time with the CIA, Slaughter met Agent Shepherd. He didn't like her either. (Morbius#7 (fb) ) - He led a covert mission team in Central America for three years until they all died on a mission in the jungle except for Slaughter. After that he suffered from posttraumatic stress disorder and a homicide/suicide complex. Slaughter resigned, gathered a team and became a freelance mercenary. Stroud hired Slaughter and his team to kill Morbius. (Morbius#6) - Slaughter waited at Stroud's apartment to start the hunt. After Stroud informed him that they finally had a lead, Slaughter was happy because he was getting tired of watching CNN. (Morbius#7) - Slaughter and the Hardcases waited at Morningstar Cemetery for the arrival of Morbius. They hid in the ground until Morbius, in his human form, approached Martine Bancroft's grave. They shot him with everything they got and Slaughter laughed because it was so easy, but Morbius wasn't dead. Slaughter was happy that he gave them a fight, but soon Slaughter's whole team was dead. As the last man standing Slaughter tried to decapitate Morbius an explosive bullet, but he didn't even get the chance to fire it. Morbius bit Slaughter and then broke all his extremities because he wanted to know who sent Slaughter after him. Slaughter wanted to die, but instead Morbius tossed him into an open grave and buried him alive. At dawn Slaughter crawled out of the ground. He was still aive and wanted revenge for what Morbius did to him and the Hardcases. (Morbius#8) - Slaughter was found and brought to St. Jude's Hospital, where a shocked Dr. Morgan Michaels (Morbius' alter-ego) had to help in keeping him alive. Two detectives approached Slaughter and heard how he mentioned Morbius and then lost consciousness. Dr. Michaels sent Slaughter up to intensive care. The detectives later asked Dr. Michaels if Slaughter said anything else because they wanted to know who he was working for. (Morbius#9) - At intensive care Slaughter received casts for his broken arms and legs. His skin became white like chalk and his body temperature fell dramatically. A nurse was surprised at how many liters blood Slaughter used up when she changed the blood packages. Slaughter woke up, broke up his casts, drained the nurse's blood and then left the hospital. (Morbius#10 (fb) - BTS) - Slaughter went on a killing spree. For one week he drank the blood of countless victims, partially ate them and sometimes even sexually molested them. (Morbius#10) - Morbius found Slaughter during another kill and asked Slaughter to surrender. Slaughter told Morbius that he was like him and a gruesome fight began. Slaughter fled into the subway system and was pushed in front of a subway by Morbius. Slaughter survived and his injuries healed after he had all his broken bones realigned (including his neck). Afterwards he felt hungry. (Morbius#10/2) - Slaughter went to Stroud, who didn't recognize him because he had lost all his memories of Morbius after the living vampire had hypnotized him. Stroud tried to shoot Slaughter, who disarmed him and then fixed Stroud's mind. Stroud remembered everything again and was asked by Slaughter to locate Morbius, who had left NYC. Slaughter then revealed to Stroud that Morbius was working at St. Jude's Hospital under the alias of Morgan Michaels. (Nightstalkers#8) - After arriving in Boston, Slaughter searched for something to eat and attacked a vagrant, but the vagrant was actually Stonecold, who was able to defend himself. Slaughter told Stonecold about Morbius and Stonecold thought that the immortality of Morbius would make him the perfect engine for his wheel. Slaughter and Stonecold decided to work together. Slaughter then took a slice of Stonecold's skin, who didn't think it was funny and punched Slaughter in the face. Some time later Slaughter, Stonecold and the Nightstalkers arrived at the Long Fellow Bridge where Morbius had been seen. Slaughter turned into mist and squeezed himself from a sewer cap into the engine of the Nightstalker's jeep. Inside the engine he turned solid and the car stopped. When Drake went to look what was wrong with the car's engine he was jumped at by Slaughter. Drake shot Slaughter with the Exorcist gun, but it was only a painful experience for Slaughter and didn't kill him. (Nightstalkers#9) - Slaughter soon turned into mist again and tripped Drake when he tried to shoot Stonecold, who had captured Morbius, from the sky. Slaughter turned solid again to eat Drake, but Blade shoved a sword between Slaughter's teeth before he could bite Drake. Stonecold grabbed Slaughter from the ground and flew away with Morbius and him. A short time later the Nighstalkers Drake & King attacked Stonecold's lab. Slaughter was hit by King, but before they landed together on the ground, Slaughter bit King's hand off although King had turned it into mist. Slaughter swallowed the mist hand, but when Morbius pulled Stonecold into the wheel, Stonecold accidentally shot Slaughter with the Exorcist gun he had taken from Drake and King's hand became solid inside Slaughter and ripped a whole into his chest. The pain was too much for Slaughter, who was glad when it left his body again as mist. With his hand reattached King hit Slaughter, but Slaughter turned into mist and left the building beneath the floor. After Stonecold's defeat Slaughter was seen in the sea grabbing the face of Stonecold's skin. (Morbius#11) - Back on the docks Slaughter killed a few men to get the blood and meat he needed to get strong again. With a gun in his hand he decided to kill Morbius and the Nightstalkers as well. He soon found them driving around in their jeep. Slaughter flew right through their front window, grabbed Morbius and flew with him away. Slaughter knew Morbius' tricks and was stronger then his enemy. In mid-air Slaughter shot Morbius several times with hollow-point bullets until he fell down to the street and was run over by a car. Slaughter was shot by Drake with the Exorcist gun before he could shoot Morbius again, but the Exorcist gun still didn't do much against Slaughter, who just got angry and began to shoot innocent bystanders. King attacked Slaughter on the roof from where he was shooting and was bitten by Slaughter. 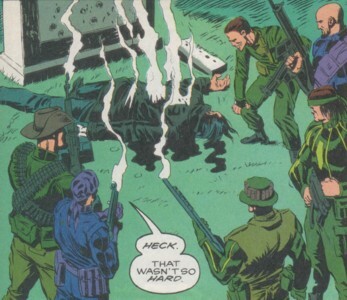 Morbius came to his aid, but was tossed from the building by Slaughter, who followed him and was in return shot again by Drake with the Exorcist gun. Morbius told Drake to continue shooting Slaughter to prevent his recovery. 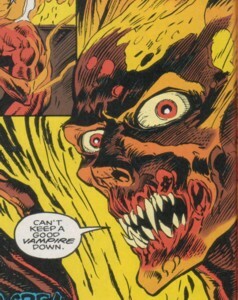 King and Morbius then ripped Slaughter apart and tossed him into an incinerator. The burning Slaughter put himself together again inside the incinerator and crawled out when the Nightstalkers and Morbius were gone. (Morbius#11/2) - Slaughter called Stroud in the Mental Institution where he had been brought to. Slaughter told Stroud that he held him indirectly responsible for his vampirism and that he would kill him after Morbius. (Morbius#21 (fb) - BTS) - Back in the mercenary business Slaughter was hired by the Maggia to catch the rogue CIA agent Randolph Simpson for them. (Morbius#20) - In search of Randolph Simpson, Slaughter interrogated Simpson's former dealer about his whereabouts. He beat him up, shot him in the knee, tossed him through a window on a balcony and then threatened to bite off his hand. The dealer gave in and told Slaughter about a woman, who bought drugs from him too, that probably knew where Simpson was. (Morbius#21) - Slaughter found the woman and she was able to tell him that Simpson was going to meet someone on the UN building. After getting the info Slaughter killed her and wroter with her blood a message for Simpson on the wall. Morbius, who had been forced by the CIA to bring in Simpson, found Slaughter waiting at the U.N. building and attacked him. During their fight Spider-Man appeared and saved Slaughter because he thought Morbius was attacking an innocent person. Slaughter thanked Spider-Man. (Morbius#22) - While Morbius still fought against Spider-Man, Slaughter crawled through the ventilation system to the parking garage. He watched as Simpson, dressed as a woman, killed two agents and then attacked him. Simpson shot Slaughter several times and then ran him over with his car (Twice!). CIA agents took Slaughter's lifeless body and brought him to their Manhattan offices. There he regained consciousness and was made an offer by the CIA. They wanted him to bring in Simpson, Morbius and Stroud for them. Slaughter wanted four times what the Maggia paid him up front for the Simpson job and twice if he brought Simpson alive. The CIA agents agreed his demands. (Morbius#23) - With the CIA's knowledge Slaughter waited in a secret CIA document storage facility for Simpson. He watched Simpson kill Agent Shepherd and then attacked him. Simpson pushed over a shelf and buried Slaughter beneath it. Simpson then fled through the sewer system with Slaughter right behind him. At the place where Simpson left the sewer system, Slaughter also encountered his former employee Stroud. He took a shot at him, but Stroud was saved by Morbius and Spider-Man. Slaughter got the upper hand against the heroes and pushed both through a wall into the place where Simpson was going to kill the next two rogue agents on his list, Morbius' employees China and Barrett. Slaughter jumped at Simpson, but Spider-Man stopped him with his net. Slaughter then knocked out Stroud and decided to go after Morbius' love Martine, who had been kidnapped by the CIA. Spider-Man pulled him away from her too and Morbius stabbed Slaughter with a broken base plate. Once again Slaughter was left for dead and began to laugh when everyone else was gone. (Dark Reign Files) - Quasimodo researched Vic Slaughter for Norman Osborn. (Wolverine: The Best There Is#1 (fb) - BTS) - Winsor hired Vic Slaughter to join his Unkillables. (Wolverine: The Best There Is#1) - In the Bayou swamps Suicide aided Vic Slaughter to retrieve the immortal Harry Sikes from a quicksand pit he had fallen into during the 1950s. (Wolverine: The Best There Is#2) - Slaughter followed Wolverine to Winsor's son. Wolverine stabbed Suicide and Slaughter after following Winsor's smell to the latter's son. They didn't care and pumped him full with bullets. (Wolverine: The Best There Is#3) - Wolverine slaughtered Vic and Suicide while they shot him and left them behind defeated. Slaughter later joined Winsor and the other Unkillables in the lab after Wolverine was finally caught and listened to Winsor's ramblings. (Wolverine: The Best There Is#5) - Scavenger, Madcap and Slaughter beat up Wolverine, but when Scavenger breathed in Slaughter in gaseous form they were both incapacitated for the rest of the fight because Slaughter's anti-life force was the opposite of what Scavenger needed and Slaughter was left stuck in Scavenger. (Wolverine: The Best There Is#7 (fb) ) - Wolverine remembered fighting Slaughter and Suicide in nightmarish fashion. (Wolverine: The Best There Is#11) - Winsor left Scavenger and Slaughter in their incapacitated state. (Wolverine: The Best There Is#12) - Winsor's son Flip telepathically aided Scavenger and Slaughter to get out of their miserable state. He joined Wolverine and the other Unkillables in devouring Winsor to end his threat. Afterward Harry Sikes and Marjorie Brink decided to keep Slaughter and the other Unkillables in line by turning them into a mercenary crew. (Gambit V#17 - BTS) - Slaughter ended up imprisoned at Pace Federal Penitentiary. (Gambit V#17) - Slaughter was one of the prisoners, which also included Griz, Icemaster, Lightmaster, Mandrill and Supercharger, taking Borya Cich's offer to kill Gambit, who had broken into the prison, for one million dollars or 100,000 for aiding in his death. He participated in the battle, which was soon joined by Gambit's friends from MI13 and the Avengers Unity Squad. The prisoners failed to kill Gambit. Comments: Created by Len Kaminski, Ron Wagner & Mike Witherby. Slaughter is not a normal vampire due to his transformation at the fangs of Morbius, who isn't a real vampire either. 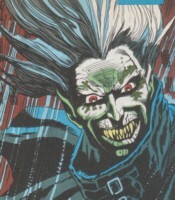 Both have vampiric features, but due to the nature of Morbius' original transformation (a scientific experiment) and the presence of the Lilin Bloodthirst in Morbius' blood he suffers from a unique form of vampirism. Vic Slaughter is a 90s product! He was one of those more wicked versions of an already existing character (Venom/Carnage, Cardiac/Cardiaxe, Ghost Rider/Vengeance, etc. ), but he was cool. I liked Slaughter despite his stupid name because he was a psychotic a$$hole (and don't forget those witty remarks). Someone should bring him back. I vote for more Slaughter in comics! Slaughter's hairstyle reminds me of the Trollville trolls. I can already picture Slaughti the troll with two guns and a leather trenchcoat. Maiming all those other trolls and drinking their blood would be so much fun. 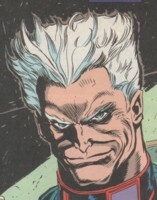 Slaughter's second name was revealed in his Dark Reign Files profile. Thanks to Len Kaminski. They were a team of vicious mercenaries gathered by Vic Slaughter. Along with Slaughter they attacked Morbius at the Morningstar Cemetery where Morbius, in his human form, visited the grave of Martine Bancroft. After shooting Morbius with all they had they thought him dead, but Morbius just turned into his vampire form and and then killed the Hardcases except for Vic Slaughter.